Relive the final breath of the pulse pounding SHOWTIME series when DEXTER: THE COMPLETE FINAL SEASON and DEXTER: THE COMPLETE SERIES COLLECTION are released on Blu-ray Disc and DVD November 18th from Paramount Home Media Distribution. DEXTER: THE COMPLETE SERIES COLLECTION includes all eight acclaimed seasons in an ultra-collectible re-creation of the actual blood slide box used by Dexter Morgan to catalog his victims on the show. Also designed specifically for this collection, “Grafix: The Art of Dexter,” is a collection of photography, fan artwork and iconography, and images used in the series’ cutting edge promotional campaigns. Headlined by Hall as the now-iconic titular character, for which he received eight awards including one Golden Globes® and one Screen Actors Guild®, DEXTER was named as one of the best-written series of all time by the Writers Guild of America. • What’s Eating Dexter Morgan? The acclaimed series follows the seemingly mild-mannered vigilante serial killer (Hall) as he spends his days solving crimes and nights committing them. 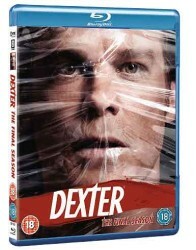 DEXTER features a stellar ensemble cast through the years including Julie Benz, Jennifer Carpenter, Erik King, C.S. Lee, Lauren Vélez, David Zayas, Geoff Pierson, Desmond Harrington, Aimee Garcia and James Remar.